Want to feel what it's like running in the latest and greatest shoes from Asics? Meet the lightest GT-2000™ ever in the 20+ year history of the series, the ASICS® GT-2000™ 3! Score the ultimate ride with this shoe's new FluidRide™ midsole that boasts an incredible combination of 15% weight reduction with 20% more bounce back. 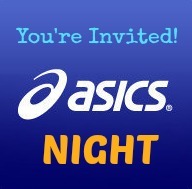 Join us for Asics Night on Wednesday, November 5th, sponsored by Asics America and Fleet Feet Sports!